While researching your ancestry you will write many notes, to-do-lists or points of interest. Evernote can replace all of this and put your research in order. Read on as I explain how this collection of guides can help you get the most from this Evernote tool. Buying these 7 resources would normally cost you a staggering $201.51. But buying this complete collection that contains a book, together with video and digital downloads, and more altogether can give you a 65% saving. Take your research with you! You can make a note on your phone for example and this can be instantly available on your tablet. When you return home from working on your genealogy research you can immediately view your notes on your home device and begin working on your findings. 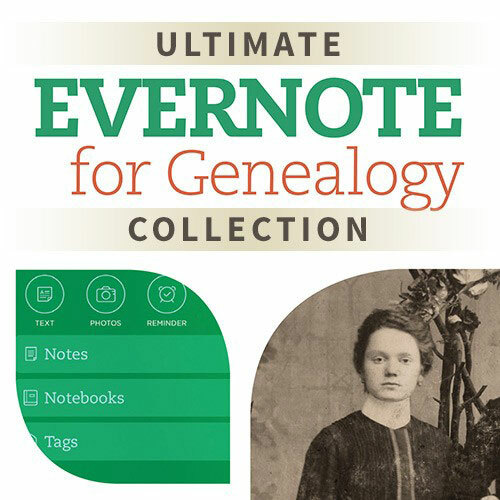 This Ultimate Evernote for Genealogy Collection is the perfect guide for you to get the most from this handy application. Create a project to-do list or take a picture of a sketch and these will be accessible wherever you go. Pretty handy if your researching your family history at a library, the archives, or even the cemetery. Find anything fast with Evernote. You can even search for words that are buried deep within your notes. Share your notes with anyone. 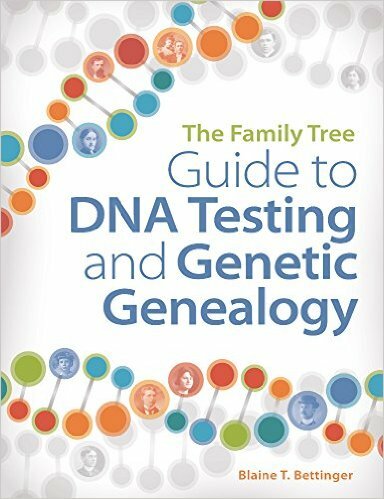 This is particularly useful if say you are researching your genealogy with another person. You can share what you have found out and they can do the same as well. Also, you can save your notes to the cloud. I have already mentioned that Evernote can be quite a useful aid for the genealogist. By keeping all of your research in one place you will be better organized. As your notes are all in one place you will be able to go to them easily and find what you are looking for quite quickly. Using Evernote will save you digging through a stack of untidy papers looking for that one note that you wrote down about your Uncle Charlie. You want tips and guidance on how you can use Evernote to improve on your fact finding. What Will You Learn From This Collection? So, those are the benefits of this Ultimate Collection. Well, this collection will show you all that you need to know about using the Evernote tool for your genealogy research. 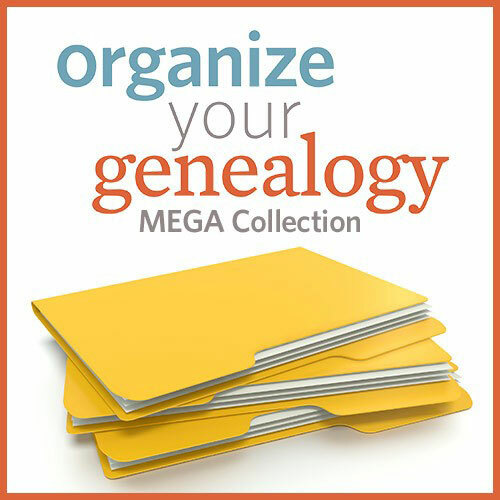 It will show you how to organize your research, the many tools that you can use in Evernote and how you can plan the next step of your genealogy research. How to take notes and organize them. The many Evernote tools, such as clipping items from the Internet, storing your photos, setting reminders, and even recording audio notes when you’re out in the field. How to develop a research plan that you can carry out. This can include tracking living cousins, or cataloging newspaper clippings for example. Learn from examples that can give you strategies to carry out for yourself. And ultimately tips on ways to secure your notes. You will get a total of SEVEN resources with this collection. These include a book, two digital downloads, a video download, a notebook, handy sticky notes and BONUS genealogy templates. As most of the resources within this collection are digital products then you will be able to utilize all of the guides, tips and strategies that you will find inside. So, while you are waiting for your book to arrive in the mail you will be able to put all of your notes together into the Evernote app. Individually this entire collection does normally cost $201.51. But if you buy this collection at Shop Family Tree then you can get it for just $69.99. That is a staggering 65% saving. A guidebook that will give you step-by-step instructions on how you can save time by both organizing and managing your genealogy research. 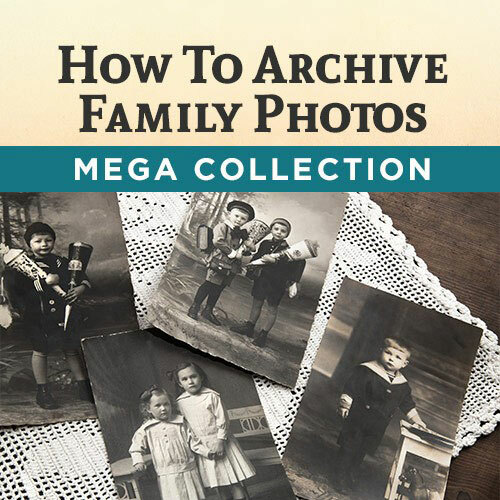 This book will also show you how to share your family history through Evernote’s free software and its mobile apps. 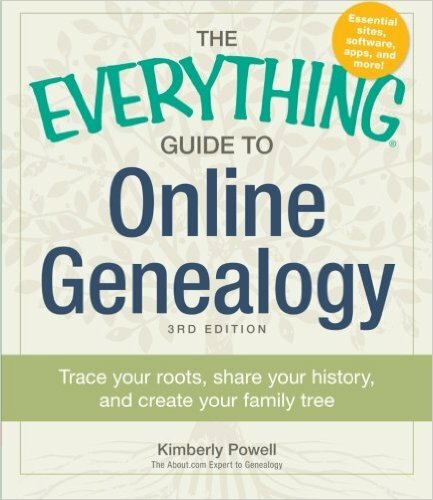 This has been billed as the only essential guide that a genealogist will need to refer to when using the Evernote tool. This is a 30-minute video class that will show you how to take notes to the cloud so that they are search-friendly and also easily accessible from any device. This 60-minute webinar will help you to declutter your notes, notebooks and folders that are on your desktop, and will show you how to use Evernote to your advantage. It will also show you tips to organize your research notes digitally by using searchable keywords. Genealogy expert Lisa Louise Cooke will show you how to use Evernote for your genealogy research. All of this is done by guiding you through 10 exciting projects that will help you get the most out of the Evernote tool. This notebook will help you to capture the pages of your notebook with either your smartphone or tablet by using Evernote’s Page Camera feature. Then when you are in the Evernote tool you can then search for your handwritten notes by either keywords or tags. As a bonus this notebook canes with three months of the Evernote Premium package. Four pads of Post-it notes that are provided in high visible colors, with 90 sheets per pad. An extra that you will get by purchasing this pack is that you will get one free month of Evernote Premium. Templates from the How to Use Evernote for Genealogy presented to you in a quick reference style. There are three packages that you can choose from when you purchase Evernote. These include Basic, Plus and Premium which offer you 60MB, 1GB and 10GB storage respectively. You can also do more with the Premium package such as organizing and annotating your PDFs for example. The BONUS includes digital templates that you will find in the How to Use Evernote for Genealogy Book. 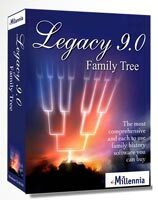 As with any genealogy tool or resource that you use you will want to get the most from it. By doing so you will know that you are carrying out your research to the best of your ability. A guide is therefore useful and handy to use in this case to help show you the way. Evernote will help you in so many ways as I have discussed during this review. 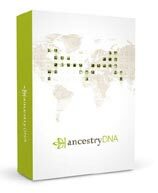 And with this Ultimate Collection you will be able to maximize your results and produce a family tree that you can surely be proud of. The savings that you can make by purchasing this entire collection is also something to consider. That $131 that you can save can be better spent on other things for your research. Such as documents and certificates of your ancestors, and even Uncle Charlie. Also the bonus that comes with this collection is not something to miss out on. These templates that are also featured in the book will help guide you with best practices and ways to organize and carry out your research. To get further help with using this great tool for your genealogy research why not head on over to the blog at the Evernote website. There you will find 8 Ways To Begin Your Genealogy Journey Using Evernote. I hope you enjoyed reading this review about the Ultimate Evernote for Genealogy Collection and how Evernote can help you. If you have any questions or comments then please leave a comment below. Wow, what a great resource! I really wish I had known about this prior to my own researching on my family’s history. However, I am now searching through my husband’s genealogy and feel this could provide some much needed help. I like that Evernote has the ability to be shared with others and multiple people can add information. This helps to move the process along so much faster. Your review was very helpful and Evernote is definitely worth trying out. Thank you! You’ve written a great article here. The page is easy to read and formatted very well. This collection seems extremely useful, especially for people (like me) who have scattered thoughts, notes in random books and find difficulty in keeping research organized. 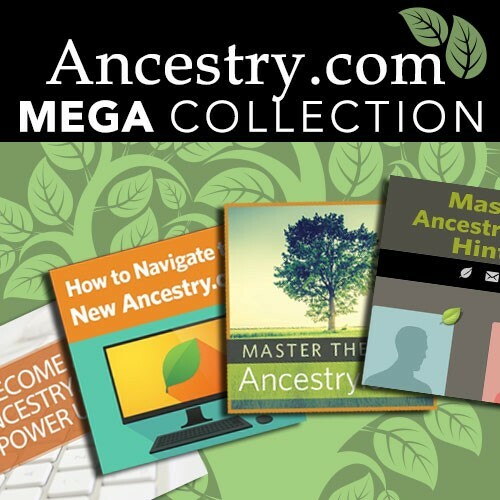 Is there a free trial that Evernote offers of this particular genealogy collection? It can get frustrating when our genealogy notes are scattered everywhere. This useful collection of guides will help put an order to all that. There are three different Evernote packages that you can choose from. There is Basic which is free, Plus $49.99 a year, Premium $89.99 a year. Here is more information on the different packages and prices. This Evernote review is really handy as well as the product itself. My mom is into family tree genealogy and is in charge of everything to do with it whenever our yearly family reunion comes up every July. She does this family tree research as a hobby and enjoys it thoroughly. This Evernote sounds like something she would need. Over the years, she and myself have found many documents and photos of both her family and my dads. She went back all the way to the 900s for her family and the 1800s for my dad. She has a lot of info and this would be very beneficial for her. I will let her know. That’s great that your family has a regular family reunion. You can share lots of stories at the event that can be written down and preserved. Your mom could really benefit from this app and this collection of resources showing her how to use it. Hi there, this sounds great and very useful. I really like all the features that you mention. In particular I like the sharing feature that allows you to share your work with others as I have found that genealogy is often a group effort. Is this tool only for genealogy or can it be used for other such projects? To get anywhere with genealogy then you must share the work load. I myself have had quite a lot of help from relatives, all working towards a common goal. You can use Evernote for other kinds of projects. This collection of resources focuses on the benefits of using Evernote for genealogy. This looks like a useful tool, and your review seems quite thorough and helpful to me. I’ve encountered challenges with trying to keep notes consistent between my phone, computer, USB sticks, email, etc, and I can see how a tool like Evernote could really help, especially if it’s geared specifically toward a certain thing (in this case, Genealogy). I’ve a feeling your article will be a great help to a lot of people. Well done! I wish I knew of this tool when I was doing my own family history research. I had notes all over the place. It can be difficult to track all the notes and leads that you have on scraps of paper so this tool is certainly helpful. As with anything that you use for your research it is helpful to have a guide so that you can get the most from it.